H.E. Shaikh Mohammed bin Khalifa Al Khalifa, Minister of Oil, congratulated Dr. Abdulrahman Jawahery, President of Gulf Petrochemical Industries Company (GPIC) and Dr. Shaikh Mohammed bin Khalifa Al Khalifa, CEO of Bahrain National Gas Company (Banagas) on the occasion of them being recognized as RoSPA Awards Ambassadors. This was from the British National Examination Board in Occupational Safety and Health (NEBOSH), and in acknowledgement of their efforts to spread a culture of safety worldwide. H.E. the Minister of Oil received Dr. Abdulrahman Jawahery, in his office today, Wednesday, 30 January 2019, Dr. Jawahery introduced H.E., Mr. Ian Taylor, Chief Executive of the British National Examination Board in Occupational Safety and Health (NEBOSH), in the presence of a number of officials of the National Oil and Gas Authority (NOGA), GPIC and NEBOSH. H.E. the Minister of Oil welcomed Mr. Ian Taylor and his delegation and all the attendees. H.E. praised the great role played by NEBOSH and its vision to preserve and improve health, safety and the environment in workplaces worldwide. H.E. noted that the rich experience of NEBOSH paves the way for Health and Safety to be recognized as a global profession with portability of credentials across national boundaries. Of particular significance is NEBOSH's desire to extend the competence of those working in high hazard industries and prevent the recurrence of accidents. H.E. stressed that NOGA attaches great importance in strengthening its relationships with various institutions, agencies and regional and international organizations specializing in this field. This contributes to the creation culture of safety as the first priority for the companies under NOGA, as it encourages them to apply the standards, principles and rules of occupational safety and health, to create a safe working environment, free from accidents and injuries. H.E. 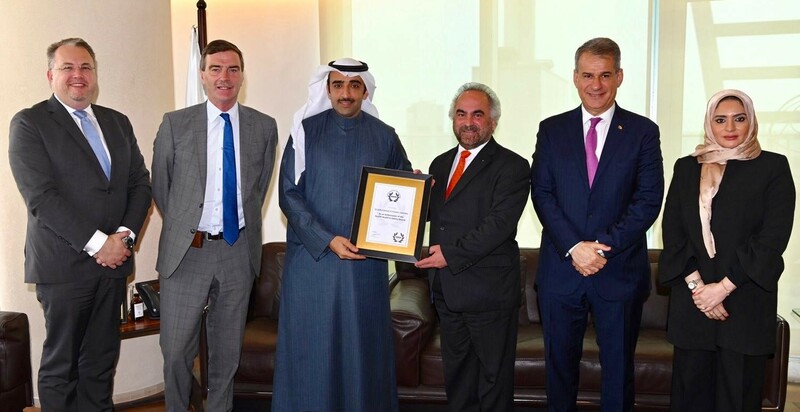 the Minister also noted the outstanding efforts of the oil industry companies in the Kingdom of Bahrain in complying with global safety standards, which have resulted in them being recognized with many international awards in the field of occupational safety and health. This is highlighted by the RoSPA Awards Ambassador recognition received by dignitaries from both GPIC and Banagas, which is a great accomplishment from an establishment such as NEBOSH who has a global reputation in many countries as a prestigious institution that strives for excellence in occupational safety and health in organisations around the world. Mr. Taylor expressed his thanks and appreciation to H.E. the Minister of Oil for the warm welcome, and the important topics discussed in the field of safety and occupational health. Stressing that the meeting was a good opportunity to exchange views on the issues of safety in the Bahraini companies and institutions. The meeting was also an ideal occasion to brief H.E. the Minister on a series of programs and certified courses that NEBOSH intends to launch in the near future.